At CCTV Camera World we are always looking for CCTV cameras that are easy solutions for common problems encountered in the security industry. One major problem was that there was no affordable and dependable license plate capture security camera that could be used in both day and night. Well that problem has been solved by the LP60 license plate capture camera. It has a 650TVL 1/3" SONY CCD and a special dual shutter rate control that allows you to set a specific shutter rate for day time capture, and another for nigh time license plate capture. This resolves the common issue found with single shutter rate cameras where they only function well either in day or night depending on their settings. This camera has 100ft of night vision and a 6-60mm varifocal lens that can be manually set by adjusting the screws located on the belly of the camera. Plates can be captured up to 60ft in day or night, and from vehicles moving up to 40mph. The lever located underneath the cap on the bottom of the camera allow the dual shutter rates to be set. There are several other image enhancement functions available from the camera's on-screen display menu (OSD) but they do not require any adjustments for plate capture. It is also an outdoor weather proof rated IP66 camera, which means it can be mounted outside in the rain/snow and does not require any cover above. 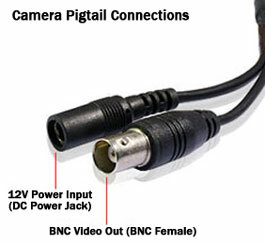 The camera outputs analog video via its BNC video out that can be recorded on a DVR. Be sure to use a real time security DVR that records at 30fps, otherwise frame skipping for your DVR's recording will miss out on the action. Will these work along side a 4M2452. Will the same dvr work or do i also need a special dvr? You can see video from this license plate camera with any DVR that accepts analog resolution security cameras. To be able to see our 4mp hdcvi cameras such as the 4M2452 you will need a 4mp HDCVI DVR. Please click on the link. What is max cable length that i can run for this camera? Using a 12V DC 1amp power supply over a coax wire from a roll you are limited to 300ft. If you use video power baluns, you can run up to 1000ft.